To make sure that the Lok Sabha Elections 2019 are conducted in a fair and peaceful manner, stringent measures have been put in place across the country. As 20 states and union territories go to vote on Phase 1 of the General Elections on April 11, authorities across the country are putting their best foot forward to maintain law and order. 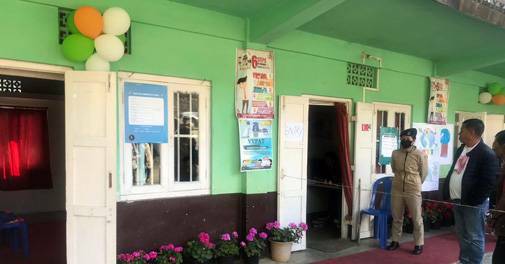 Amid this, authorities in Nagaland have put up a model polling station in the state's Zunheboto town. The model polling station offers creche facility, drinking water and is plastic free. There is a waiting room as well. Voters are issued tokens to make use of the facilities. Official spokesperson of the Election Commission of India, Sheyphali Sharan, took to Twitter to share images from the special polling station. Two similar model polling stations have been set up in Andhra Pradesh as well. These polling stations in Kakinada are managed by women including the police force and supervisor. The Chief Electoral Officer of Andhra Pradesh took to Twitter to share images of the stations. Nagaland and Andhra Pradesh are two of the 18 states going to the polls on Phase 1 of the General Election 2019. Twenty five parliamentary constituencies in Andhra and 1 in Nagaland are voting today. Andhra Pradesh is conducting polls for Araku, Srikakulam, Vizianagaram, Visakhapatnam, Anakapalli, Kakinada, Amalapuram, Rajahmundry, Narasapuram, Eluru, Machilipatnam, Vijayawada, Guntur, Narasaraopet, Bapatla, Ongole, Nandyal, Kurnool, Anantapur, Hindupur, Kadapa, Nellore, Tirupati, Rajampet, Chittoor. Nagaland is the sole constituency in the Northeastern state going to the polls.